Oakland, California — 9 May 2013 — METTLER TOLEDO presents its next generation of Rainin multichannel pipettes. The manual Rainin Pipet-Lite XLS+ and electronic Rainin E4 XLS+ offer users durable, lightweight liquid ends and new mechanical designs that all but eliminate hand strain while ensuring the highest channel-to-channel consistency. This combination of improved ergonomic comfort and exceptional performance—long the hallmark of Rainin multichannels—helps pipette operators work more comfortably and reduce the risk of error and potentially expensive rework. 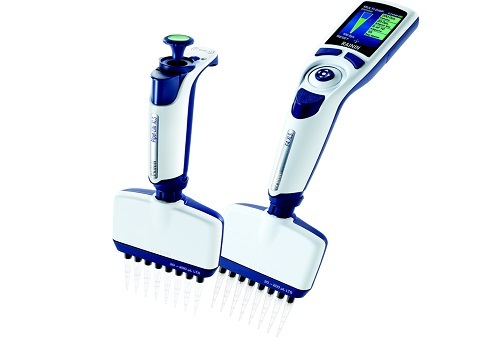 Experiment costs go down as throughput accuracy increases.Whether a research team’s objective is to be “first to publish” or “first to market,” the Rainin XLS+ multichannel pipettes represent an intelligent advance in both performance and ergonomics. Reduced weight and lower pipetting/tip-ejection forces – combined with improved balance – reduce operator fatigue during intensive 96-well plate work. Enhanced reliability ensures data integrity. And operators concerned about cross-contamination will appreciate XLS+’s reduced stiction (piston stickiness), which helps to eliminate splash-up. Capitalizing on recent advances in molding technology, Rainin has achieved an optimal balance between lightness and performance—two goals that often run counter to one another. In addition to new internal designs and materials, new smaller surface-area lip seals require less force and reduce drag. Taken together, these and other new design elements reduce weight and increase reliability for a more pleasurable—and repeatable—pipetting experience. Pipet-Lite XLS+ and E4 XLS+ models will be available in volumes up to 300 µL worldwide by the end of March. To discover how the new Rainin XLS+ pipettes can help improve multichannel pipetting and overall hand- and cost-savings, or to demo manual or electronic XLS+ models, contact your METTLER TOLEDO representative or visit www.mt.com/rainin-mc.